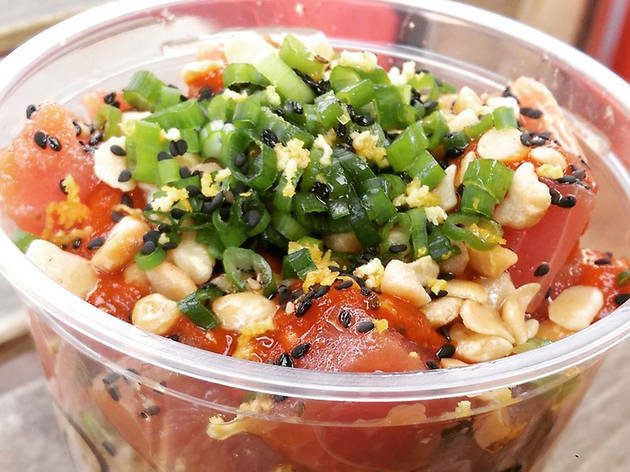 Bay Area natives Reza Morvari and Angel Serratos first pulled their Bowl’D Acai food truck into San Francisco in August 2014 and expanded into poke bowls in 2016. The Bowl'D Up rig does brisk business in front of the mid-Market Blue Bottle weekday mornings, where regulars line up for smoothies, acai bowls and poke. The limited menu offers an “OG” tuna, salmon or tofu bowl, all served with green and white onions, masago, seaweed salad, sesame seeds, dried shallots, and avocado. (Feeling iffy about raw fish from a food truck? 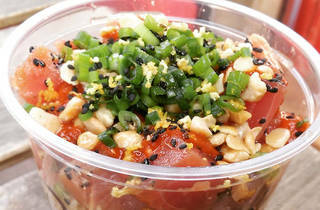 The poke can be seared or cooked all the way through upon request.) Add-ons include serrano peppers, ginger, and crush macadamia nuts. Tack on a can of Hawaiian Sun juice for $3.